Is the "Blackout Curse" back? After picking up big SEC Wins in the 2015 and 2016 "blackouts", the Bulldogs had a winning record in black and it appeared that the stigma of "we always play bad in black" was quickly becoming outdated. 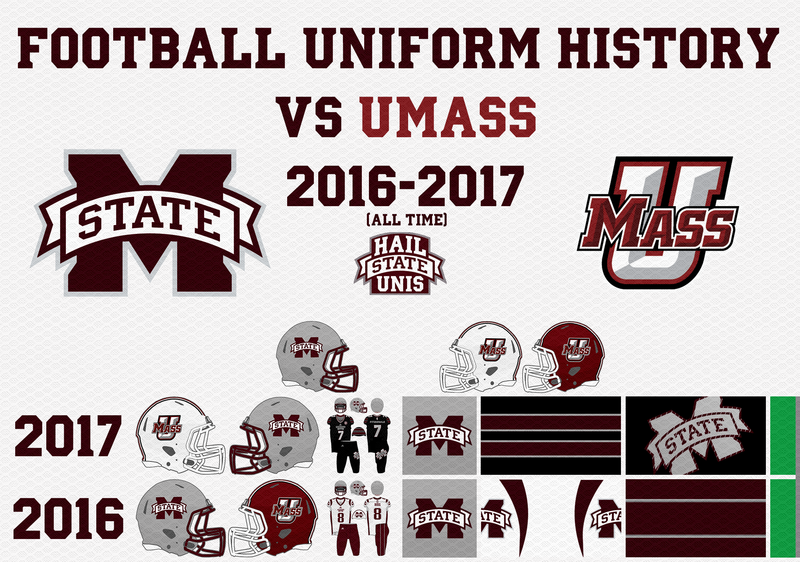 However, when the Bulldogs trailed UMass by a touchdown at halftime today, the correlation between black uniforms and poor play seemed as relavalent as ever. Of course, the Bulldogs did come back to outscore UMass 21-3 in the second half and win the game 34-23; they're the #16 team in the country for a reason. Still, today joins the 2011 LA Tech game as one where State won, but struggled, against a non-Power 5 opponent while wearing black. It was actually a similar game to last year's against UMass in Foxborough, when the Bulldogs wore Patriots-themed alternates, trailed at halftime, but ended up winning by 12. In both of their games against UMass, State has worn alternate uniforms with silver helmets; maybe we'll see a traditional matchup in 2020, but I wouldn't count on it. Honestly, UMass is a good team to wear alternates against; we've had some great uniform matchups with the "traditional" SEC schools this year, and I'd like to keep that up. As far as on the field results go, the first two times State wore black were against Alabama and LSU. In 2009 and 2010, those were of course losses. The last four times, State has won in black. As mentioned above, they played sloppily but beat LA Tech in 2011 and UMass today. In 2015 and 2016, they played really well in black and beat Kentucky and #4 Texas A&M, respectively. Overall, the Bulldogs now have a 4-2 (2-2 SEC) record in black jerseys. This year's blackout uniform is up there with 2015 as the Bulldogs' best ever. After seeing both on the field, I still can't decide if I like the silver or matte maroon helmet better with this uniform; the silver helmet goes really well with the shiny silver numbers, but the matte maroon matches the stripes and is just a better helmet in general. The worst part of the look, by far, is the oversized pants logo, which made its first appearance today since last year's blackout game. As I shared on Twitter Thursday night, there are a few modifications that State could make to elevate this from a decent to a great alternate look. The uni model for today's game is #18 Deddrick Thomas, who returned a punt 83 yards for a touchdown late in the 4th quarter to seal the win for the Bulldogs.